Audioengine’s new B2 Bluetooth Speaker is the best single-cabinet AC powered speaker you have never heard, with the best Bluetooth range you have never experienced. B2’s design is as retro classic as its engineering is advanced. Two powerful speakers are shielded and mounted in a natural wood cabinet that is available in three finishes. Audio output is studio reference quality for flat frequency response, and maximum volume will soon shake your windows and rattle your walls. The front fabric grille is unadorned, as is the wooden cabinet. Power, Bluetooth, volume, and AUX input are all on the rear panel. No volume level markings are provided, because Audioengine expects users to do set it and forget it volume on B2, and adjust loudness from the source device, such as iPhone and iPad. B2’s sonic profile is decidedly neutral to bass, allowing for customized equalization and personalized tonalities. Break in period for the powerful speakers is 20 to 50 hours, so play this speaker system loud and proud, and notice the audio sweeten day by day. 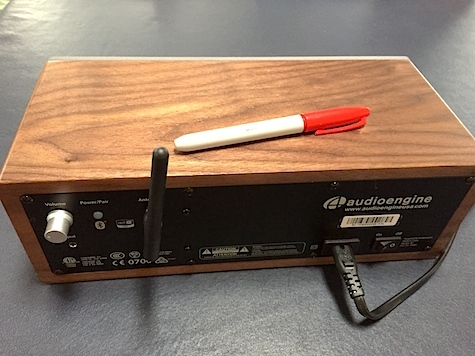 The Audioengine company offers free USA shipping with no sales tax, plus a 30-day audition. 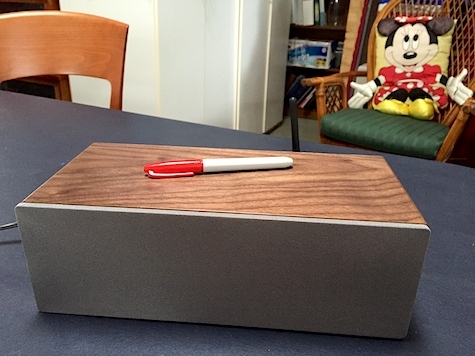 The physical product is compact, substantial, and built for a lifetime of listening. Room and surface placement vary the audio experience, so test your B2 in different locations before deciding on a permanent spot. This speaker is heavy, yet easily can be moved as desired. The front cloth grille can be removed when exposed speakers are preferred. Aside from all its finer points above, the major reason to purchase the B2 speaker is right in its name: Bluetooth. A small antenna receives Bluetooth audio at full quality up to 100 feet (line of sight), or 50 feet through walls and doors. MyMac has been testing Bluetooth speakers since they first were introduced, and B2 makes all prior Blueteeth rotten in comparison. B2 has excellent sound throughout its massive volume range, which is the test of a high quality speaker system. Lower levels are ideal for casual or background listening. Medium levels are perfect for enjoying fine music. High volume will keep a party dancing for hours, and annoy your neighbors until you invite them to boogie. Audioengine claims this product has Dual front ports for extended bass, and they are not kidding. 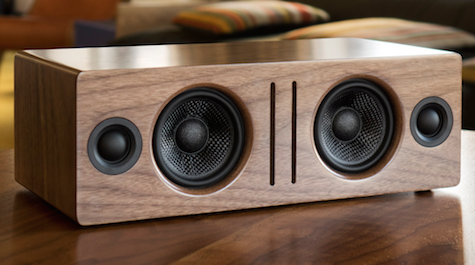 Bass is smooth and powerful like you never have heard from such a speaker. The company’s dedicated web site for this product is rich with information. Spend time studying B2’s Overview, Features, Tech Specs, and FAQ at the links above and below. MyMac Review Rating is 9 out of 10, with a “worth every penny” personal recommendation.